Photo: A woman we employ at the farm is happy for a good harvest for our children, and grateful for the job it provides her. 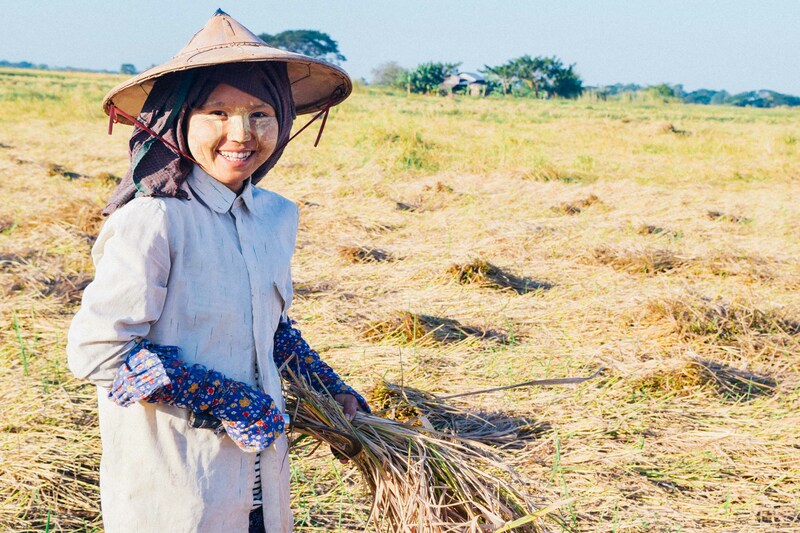 We are happy to report that the fourth harvest at our Myanmar rice farm was a success earlier this month. The crop yielded approximately 6 tons of rice at the 12 acre farm. This is a decrease from last year’s harvest due to unfortunate heavy rains during planting season that affected our yield significantly. Even so, we are thankful for a good harvest that will feed 140 orphans and the staff in our 4 orphan homes, and also dozens of indigent elderly widows under our care. The amount of rice we harvested this month will provide 41,580 servings of rice, which is a great blessing to the children’s health. This dietary staple provides the children with fast and instant energy, regulation of digestion, stabilization of blood sugar levels, fortification of the immune system, an essential source of vitamin B1, and it also provides protection against dysentery, cancer, and heart disease. Photo inset: (Top-left): Girls at one of our Myanmar orphan homes are grateful for a warm meal provided by food from our farmland. (Top-right): These children are delighted to receive a much-needed motorbike for easy & safe transportation for their caregivers. (Bottom-left): Boys at one of our Myanmar orphan homes are thankful to have a joyful, loving family environment. 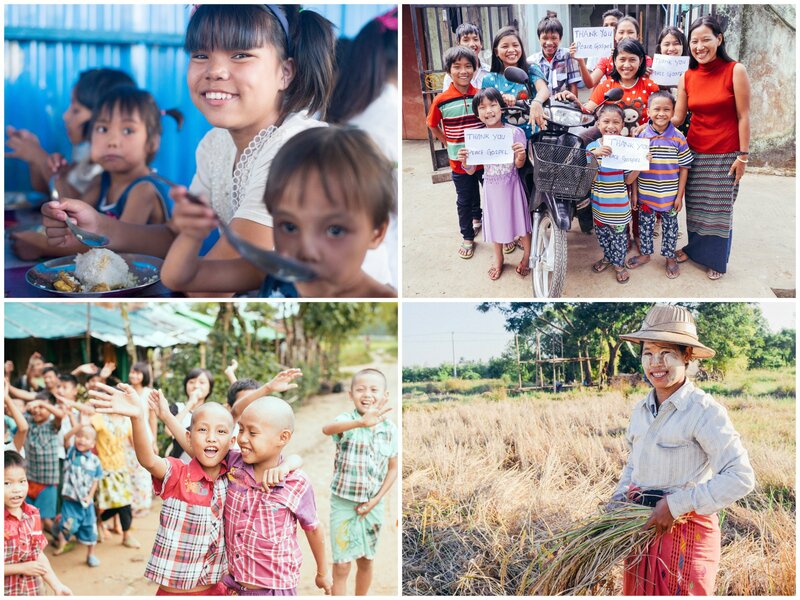 (Bottom-right): Our Myanmar team is thankful for a successful harvest at our rice farm earlier this month. One 50 kg bag of rice retails on average at $38 in the market, thus this harvest will save us $4,180 from not having to buy the same amount of rice from the market. Adjusted for United States purchasing power based on per capita GDP comparisons between the two countries, this would be as if a similar organization were to save $267,000 in the United States. In layman’s terms, $4,180 is a big deal in Myanmar— it’s equal to about 5 year’s worth of wages. We will begin planting rice again in May or June of next year depending on the weather, and we are praying for a more bountiful rice harvest in November or December 2016. In other good news, thanks to your generosity, we were able to purchase 4 motorbikes — 1 for each of our orphan homes, a timely blessing at Christmastime. The motorbikes are very helpful for easy transportation to and from market to buy food for the children, and to easily transport the children to the local medical clinic if they become sick. The motorbikes also allow us to travel back and forth to each of our 4 orphan homes to tend to repairs or other needs on our campuses. The children are very excited about the motorbikes since some of them have never ridden one before and never dreamed of such a luxury in their lives. And our directors are certainly happy for the upgrade from bicycles. There’s so much we’re thankful for about our progress in Myanmar for 2015, but we couldn’t be happier with such great news to close out the year. Thank you for being a part of this work — the ultimate harvest of which is rescued and transformed lives.